Where will Gay end up? Let us know! 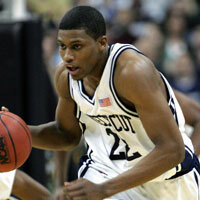 Along with Memphis' Rodney Carney, Rudy Gay is one the top athletes in the 2006 NBA Draft and quite possibly has more potential than any draft candidate. Gay, as a sophomore, averaged 15.2 points on over 46% shooting and 6.4 boards for the Huskies in 2006, leading Connecticut to a 30-4 record. He was versatile defensively as well, picking 1.8 steals and blocking 1.6 shots. Compared often to Scottie Pippen for his athletic 6-foot-9 frame and long arms, Gay was considered the top recruit out of high school in 2004, averaging 21.2 points, 9.2 rebounds, 3.7 blocks and 1.6 steals as a senior for Archbishop Spalding in Maryland. In a word, explosive. Long and athletic, Gay can soar to the rack for high-flying slams and pull up for a soft jumper. Perfect size and skills for the NBA three. Could be a terror for opponents in the running game. His wingspan makes him effective on defense, picking up blocks and steals at a solid clip, but with the right coach he could explode defensively given his skills. Good rebounder. Decent handles. Can he bring it every night? A huge enigma, Gay is far from consistent. He will dominate then disappear for long, long stretches. He's such an athletic freak that many wonder why he didn't do much more at UConn. Shot well from three as a freshman, but dropped to less than 32% as a sophomore. Gay will have to learn a lot more about one-on-one moves at the NBA level as he's been able to get by on his athleticism alone. Rudy Gay on the Houston Rockets? The Rockets can only hope to be this lucky. While it's possible Rudy Gay could slip, it's not likely that he would get past the Timberwolves at #6 or Celtics at #7. The size and skills of a Tracy McGrady-Rudy Gay combination alongside Yao Ming could make the Rockets deadly and capable of beating you in many ways.